It may be spring, but there are still patches of winter in the park even though snowdrops wave their tiny white flowers. I’ve not yet found a spear of chive or a leaf of early mint and the parsley’s still a flat mossy mat. Everybody’s weary of the roasted root veg and the thought of more broccoli and cousins excite no one. With another few weeks before we see any local asparagus or arugula, we’ll sit tight and make the best with leeks and a few old spuds. Leeks give us an inviting gentle onion flavor and the light green of springtime. For years I’ve whizzed up gallons of pureed leek and potato soup, but this time I want my leeks to shine and my potato to be a creamy backdrop. The days are still cool enough for bowls of hot soup. 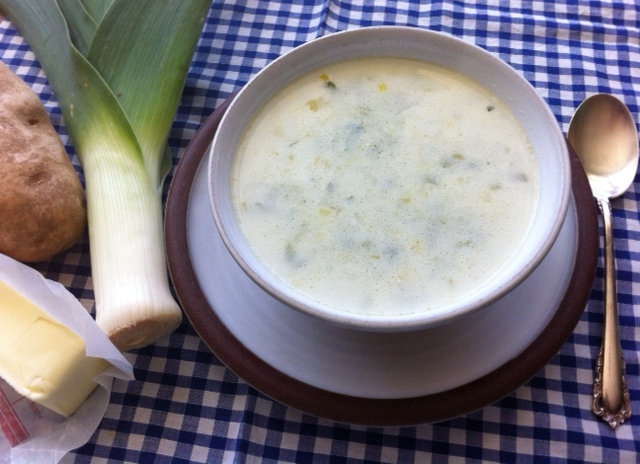 Perhaps best of all, in the classic French tradition a leek and potato soup demands no stock. With a few flavor perks of garlic and green chili, this one-pot friendly potage will tide you over until farmers truck out their asparagus with flavor umatched by imported spears. Trim roots and any blemished leaves from leeks, and plan to use entire leek in soup. Cut off light-colored bottom of the leek, the lower third. Wash carefully and slice thinly, measuring 2-3 cups. Melt butter in a 4-5-quart heavy pot and sweat Spanish onion slowly over low heat until translucent. Add the light part of the sliced leeks and continue to sweat (tent with butter wrappers to encourage even cooking). Add garlic, chili, diced potatoes and stir into the onion mixture until garlic is fragrant. Add water, salt, cover and simmer until potato is almost tender, about 10-15 minutes. Meanwhile split the green part of leeks and wash carefully to remove any trace of sand or dirt inside leaves. Strip the wide leaves into ½-inch ribbons and thinly slice green leek tops,measuring about 4 cups. Add green leeks to simmering soup and cook another 10 minutes or until potatoes are falling apart and green leeks are tender. Add mixed milk and cream or 1 cup half and half. Taste for seasonings, adding more salt and some white pepper if desired. Stir in a handful of chopped parsley. Crush potatoes lightly with a potato masher until they dissolve in soup. Ladle into bowls and enjoy with warm whole grain toast. Makes 10 cups of early spring soup. You are currently browsing the Mary Jo's Kitchen blog archives for April, 2013.